Today is October 16 and it’s been several months since we’ve blogged. We initially thought blogging would provide an additional means of communication for those affected by incarceration, but that hasn’t been the case. Social media is so popular now, with Facebook being at the top of that list. So, many opt to use social media for privately messaging their concerns and crises. So, we’ve decided to hold the Blog page for special issues we’d like to write about; keep it available for those who are just interested in who we are; how we think; what we do, but we won’t be posting regularly on this blog. You can find us on Facebook…we have a Twitter account; even Instagram and Pinturest, but we’d rather communicate “blog-like” on Facebook. Our most active accounts are the conference page, and the Advocacy in Action Coalition page–it’s the national End Mass Incarceration page. “Like” them both. Message us. We will respond. Of course you can always call us at 915-861-7733….if we can’t answer immediately (maybe we’re trying to help someone else; maybe we’re on a conference call preparing new advocacy material; maybe in a meeting or even sleeping! ), PLEASE LEAVE A MESSAGE. We really want to talk to you, but of course we won’t even know you are trying to reach us if you don’t leave a message! And, if you’re too shy to call, e-mail us. 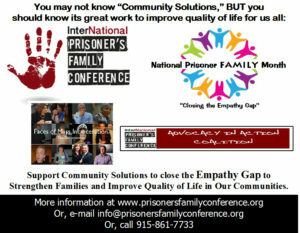 We check the conference e-mail most frequently – info@prisonersfamilyconference.org. We try to review our e-mail accounts at least twice a day! So we will get back to you pretty quickly. And, occasionally check out this Blog page…add your comments…we occasionally write on topics of serious concerns to prison families, we’d love to have your feedback. By the way, we have our first major on-line fundraiser coming up in November. We sure hope you will join our team and help us win at least a small share of the Newman’s Own Holiday Challenge. Whatever OUR TEAM RAISES we get to keep…and it may put us in the running for some of their big prizes. And really, no donation is too small; together all donations add up to become a huge help. Thanks of thinking about us.